"The Last One Out Is A Rotten Egg!" Russ is a former Art Teacher who hails from Wellsburg, West Virginia. Russ is a truly unique artist in that he creates the paper that becomes his artwork! To create his beautiful embossed engravings, he starts by carving images into an acrylic template. Derived from dried flower petals and other organic materials, the paper pulp is created and then sized with an acrylic fixative & UV preventative to allow for workability and to ensure longevity of the finished product. The sized pulp is then pressed into the carved template, where it is left to dry for 4-5 days. Once the pulp is completely dry, it is run through an offset printing press. The intense pressure allows for the clarity of the three-dimensional images . The pulp, now paper, is run through a series of 10-15 presses, with increasing pressure. 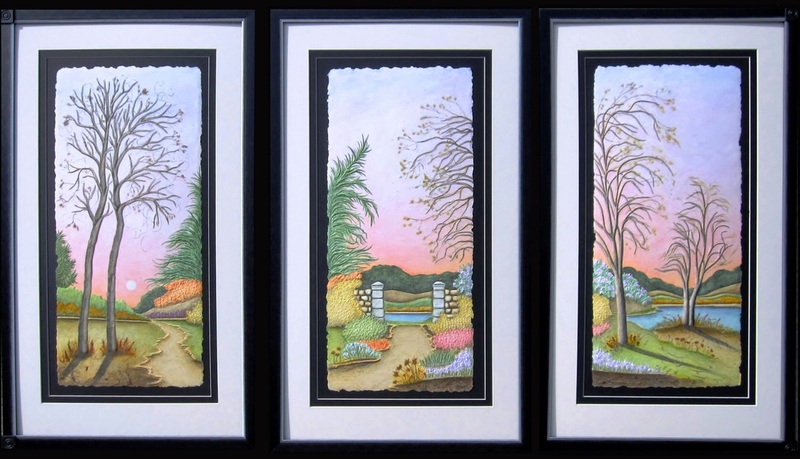 The resulting artwork may be left as a “natural” piece, but Russ often enhances his natural images by hand-painting them with watercolors, to create one-of-a-kind embossed engravings. The images in his artwork are inspired by his family life and travels. Many of the materials used in creating his paper are grown at his home, while others are collected while traveling with his family. Examples include homegrown ferns, lambs ear, hydrangea & magnolia; seaweed & plankton from the Atlantic & Pacific Oceans and the Caribbean and numerous wildflowers from throughout West Virginia, Virginia, Pennsylvania and the East Coast.